Plus navigating the music business in the Internet age, and a slew of new local releases and shows. 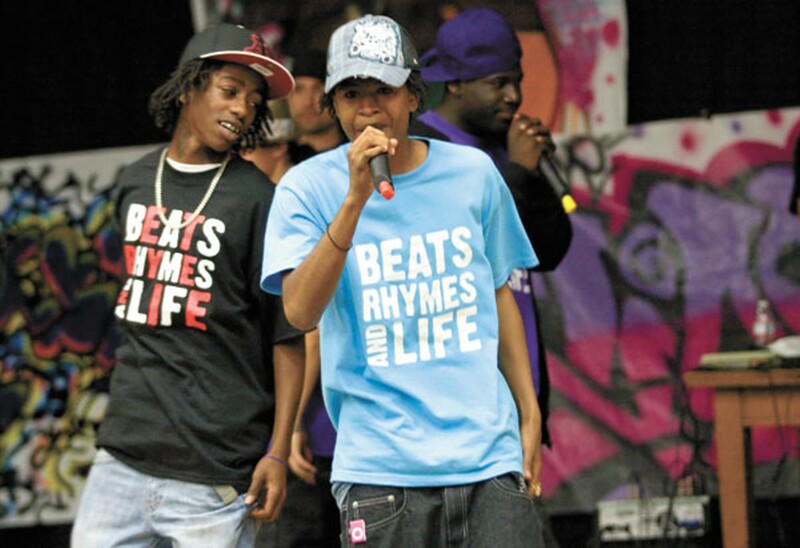 Students of Beats, Rhymes & Life. A hip-hop therapy program called Beats, Rhymes & Life, based out of Oakland High School, is the subject of a forthcoming documentary by local filmmaker Kerri Gawryn. The five-year-old program "strives to address the psychosocial needs of youth of color in a manner that build upon their strengths, embraces their cultural expressions and empowers them to become agents of change and advocates in their community and beyond." Filmed during the first half of last year, the doc captures the workshop's weekly meetings, rehearsals, recording sessions, and culminates in a performance at the Oakland Metro. The goal, Gawryn said, was to "to show the potential that young people have if they're given access to these kinds of resources and how they can really thrive if they're given access to art and to mentoring." The obstacle now is completing and editing the film. Gawryn has a $10,000 challenge grant from the East Bay Community Foundation, but needs to raise the same amount in order to get the funds by March 13. To accomplish this, Gawryn is throwing a fund-raiser at the New Parish on Friday, March 12. "For the Love: A Hip Hop Soiree" will feature a buffet-style dinner and speakers such as Councilwoman Pat Kernighan and A-Plus of Hieroglyphics. Youth from the film will be performing, and a fifteen-minute clip will also be shown. An after-party will follow. 7 p.m., $50 includes the dinner and after-party; $10 for the after-party at the door. For more info, go to BRLFilmProject.com. There's no question that the Internet has dramatically altered the music business. While it's opened some doors (allowing musicians to self promote and release music cheaply and independently), it's also posed a tougher question: namely, how to make money. Newly formed nonprofit, Oakland Digital Arts & Literacy Center will hold a workshop on Thursday, March 4, to tackle this subject and others. Entitled "Evolution of the Music Business in Web 2.0," the free event will feature speakers such as Alan Khalfin of MixMatchMusic.com, Ethan Diamond of Bandcamp.com, Ray Luv of PTBTV Records, Stephen Hogan of Pandora Internet Radio, and others. "This workshop was just an idea of how do we connect with young people, get them excited, but really what we're doing is opening their eyes to a whole new world," said Shaun Tai, Oakland Digital Arts & Literacy Center's founder and executive director. Space is limited to ninety people, so arrive early. 6:30-8:30 p.m., free, donations accepted. At Hub Berkeley at the Brower Center (2150 Allston Way, Suite 400, Berkeley). Though the Haitian earthquake has all but vanished from the mainstream media's radar, local musicians continue to spotlight the need for sending relief to the country. Local hip-hop artist Young Haitti is donating 50 percent of the proceeds from his album, The Baydahaitian, to the American Red Cross Haiti Relief Fund. Latin jazz singer Kat Parra is also donating $1 per CD sale of her recent album, Dos Amantes, to the Save the Children Fund, which helps orphaned kids. Alt-country musician Bob Harp will play a benefit show at the Red Devil Lounge on Wednesday, March 10. 9 p.m., $5, $8. Two days later, Phil Lesh will throw his 70th birthday bash at the Bill Graham Civic Auditorium, with all net proceeds to support Haitian earthquake relief. March 12, 7:30 p.m., $41.50, $125. Thom Yorke's solo project, Atoms for Peace, will play Oakland's Fox Theater on April 14 & 15. Tickets go on sale March 7. ... Amoeba in Berkeley will host a free performance and signing by Tegan and Sara on Thursday, March 4, at 5 p.m. ... Mastodon, Between the Buried and Me, High on Fire, Baroness, Priestess, Valient Thorr, Black Cobra, and Bison BC will play the Fox Theater in Oakland on May 8. ... A new rock bar called Heart & Dagger Saloon opened at 504 Lake Park Avenue in Oakland. ... Rick Estrin & the Nightcats celebrate debut release, Twisted, on March 7 at the Tri-City Bluesfest happening at the Saddle Rack in Fremont. 2 p.m., $30, $50 for VIP. ... The morning benders release Big Echo on March 9. CD release show is March 30 at the Independent. ... Oakland metal band Abscess release Dawn of Inhumanity on March 9. ... And black metal documentary Until the Light Takes Us starts its run at the Elmwood Theater on March 5.